An unbeatable, pocket-sized guide to Naples and the Amalfi Coast, packed with insider tips and ideas, colour maps, top 10 lists, and a laminated pull-out map - all designed to help you see the very best of Naples and the Amalfi Coast. Uncover historical treasures at the Museo Archeologico Nazionale, devour a Neapolitan pizza hot from the oven, wander the ancient towns of Pompeii and Herculaneum, or explore rugged the coastlines of Amalfi, Ravello and Positano. From Top 10 piazzas and fountains to the Top 10 Neapolitan dishes - discover the best of Naples and the Amalfi Coast with this easy-to-use travel guide. Staying for longer and looking for a comprehensive guide? 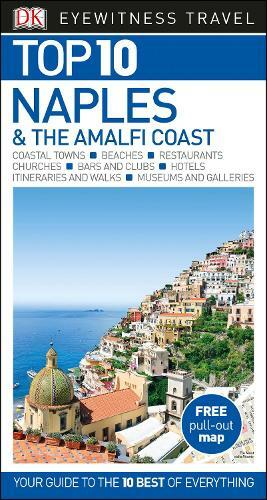 Try our DK Eyewitness Travel Guide Naples and the Amalfi Coast for more in-depth information. when i heard my daughter was taking me to Italy i sought out this little book and bought her one as well. Found the book very informative and interesting.